When it comes to watching sports, the royals certainly don't shy away from showing their emotions. A month after the Duke and Duchess of Cambridge tensely watched a match at Wimbledon, the two left Prince George at home to spend Monday at the Commonwealth Games at the SSE Hydro stadium in Glasgow, Scotland. Prince Harry was also in attendance and joined his brother and sister-in-law in the stands to watch Scotland play Wales in field hockey. Duchess Kate, whose adorable reactions ran the gamut from gasping to grinning to covering her mouth with her hands, wore one of her signature looks: navy pants, a blue blazer and wedge heels. 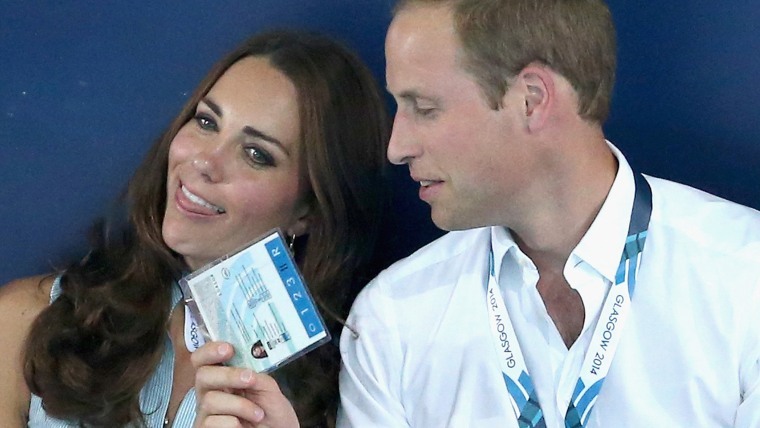 She and Prince William also watched the swimming events, where it appeared that even royalty can get overheated. Kate shed her blazer for a sleeveless top while her husband and another fan tried to help her cool off. The Commonwealth Games take place every four years and features 6,500 athletes from the Commonwealth of Nations competing in a variety of events, including swimming, badminton, boxing and other sports.